Dirk van Dalen's biography studies the fascinating life of the famous Dutch mathematician and philosopher Luitzen Egbertus Jan Brouwer. Brouwer belonged to a special class of genius; complex and often controversial and gifted with a deep intuition, he had an unparalleled access to the secrets and intricacies of mathematics. Most mathematicians remember L.E.J. Brouwer from his scientific break… throughs in the young subject of topology and for the famous Brouwer fixed point theorem. 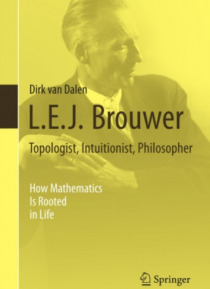 Brouwer's main interest, however, was in the foundation of mathematics which led him to introduce, and then consolidate, constructive methods under the name 'intuitionism'. This made him one of the main protagonists in the 'foundation crisis' of mathematics. As a confirmed internationalist, he also got entangled in the interbellum struggle for the ending of the boycott of German and Austrian scientists. This time during the twentieth century was turbulent; nationalist resentment and friction between formalism and intuitionism led to the Mathematische Annalen conflict ('The war of the frogs and the mice'). It was here that Brouwer played a pivotal role. The present biography is an updated revision of the earlier two volume biography in one single book. It appeals to mathematicians and anybody interested in the history of mathematics in the first half of the twentieth century.